Our sincere gratitude to ALLISON MORLEY for her effort and expertise in researching and producing our hallway photo displays. The displays are rotated on a periodic basis. In 1857, James Boorman Johnston commissioned the young Richard Morris Hunt, America's first French-trained architect, to design studios for artists to create, exhibit, and sell their work. The highly successful Tenth Street Studios, in which interconnected rooms radiated off a central domed gallery, became the center of New York's art world for the remainder of the nineteenth century. From his own studio, Hunt established the country's first architectural school, and an impressive array of academicians, including most of the Hudson River School, worked there. 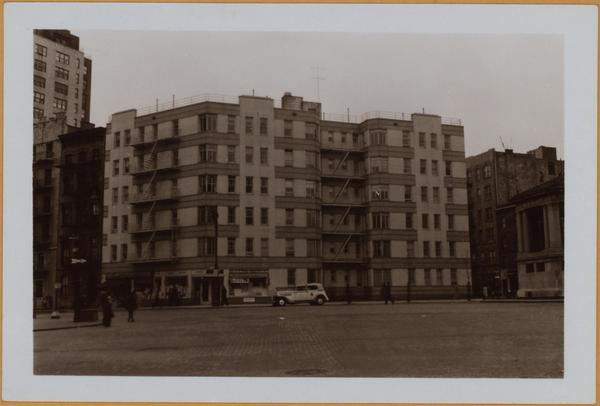 In 1956, the building was razed to make way for the Peter Warren Apartments, an 11-story building named after an eighteenth-century Village landowner. In front of the famous Gaslight Cafe, the owners pretend not to pose. One of the many vegetable and fruit carts to be found lining Bleecker Street in Greenwich Village. 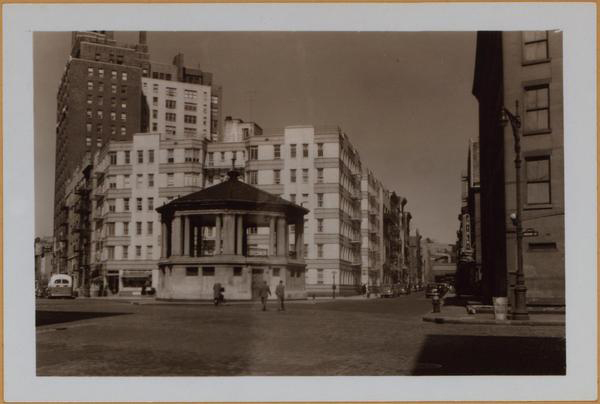 View of the northeast corner of Abingdon Square from Bleecker & Bank Streets. Note that the site of our building was once the Abingdon Hotel. One of Greenwich Village's oldest buildings, this corner store at Christopher & Bleecker Streets was built as a grocery in 1802. Its top floor was reputedly the office of the commission that laid out the 1811 grid plan for the development of Manhattan Island. In 1828, when a bend in Bleecker Street was eliminated, the store lost 20 feet of its width. Abbott's photograph shows the building's 1828 truncation. A Greenwich Village artist uses the sedan to hawk her artwork. A milk wagon at 8-10 Grove Street. Abbott's streetscapes often included horse-drawn wagons, relics of an earlier age. In this Grove Street photograph, taken the same day as several others near her Commerce Street studio, a horse-drawn wagon is her central subject. The Grove Street houses behind the milk wagon were built in the 1820s and remain largely unmodified. Docks on the lower West Side, at Christopher Street. Notice the abbreviated horse cars of the period. As typhoid fever hits the village, stores are forced to close. In the heart of Little Italy — anchored by the famous Church of Our Lady of Pompeii at Bleecker and Carmine Streets — were numerous food specialty shops, such as the cheese store run for 15 years by the Mandaro family at 276 Bleecker Street. Making their own products, such as caciotella and provotella, the Mandaros also imported cheeses, such as the Bel Paese lining the window's front edge. The Mandaro storefront has been taken over by John's Pizzeria, a neighborhood institution that opened in 1934. 146 West Fourth Street, New York. The owner, "Doc" Sherlock, a veteran of the fledgling motion picture industry, sometimes permitted customers to tour his top-floor studio quarters. Meanwhile, "Tiny Tim" Felter, known as the Candy Man, peddled "soul" candies from table to table, each candy wrapped in a snippet of psychological verse. 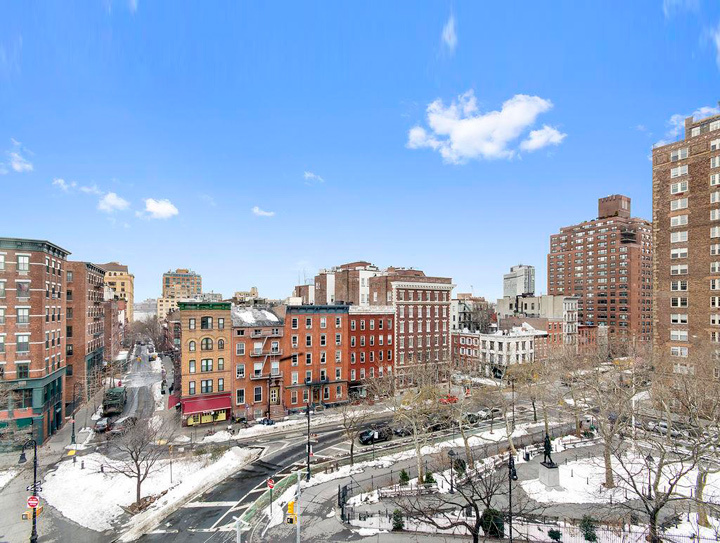 View of Greenwich Village, New York, at West 8th Street near Fifth Avenue. 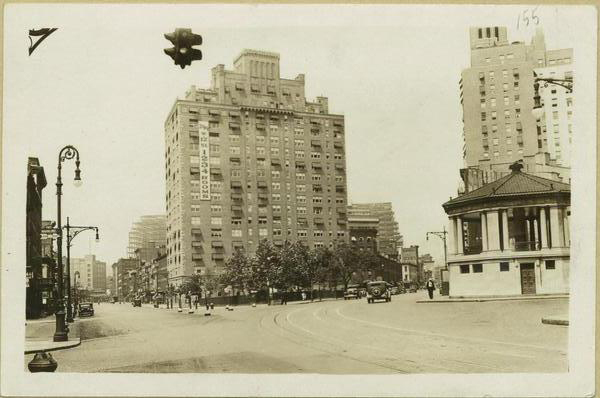 West 11th Street, looking west from Waverly Place (old Hammond Street). Aftermath of the blizzard. 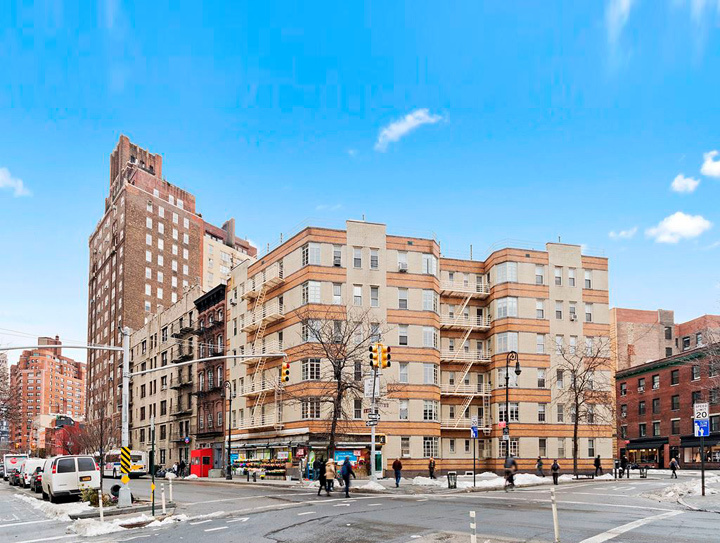 Greenwich Avenue, Northeast corner at Seventh Avenue. The Riley Stables, shown just before their demolition to make way for a Loew's cinema. The movie theater can be seen in a 1938 photo displayed on the Sixth Floor West. The car parked up Seventh Avenue is a 1915 Model Ford. First paved in 1893, Charles Lane is still cobble-stoned, but its buildings, both old and new, are now residential. Although the elevated highway and freight viaduct have been demolished, the narrow alley has retained its scale and quaint character, after a successful battle in the late 1960s against a proposal for a high-rise housing project. Greenwich Street, looking north from Bank Street. View of the Ninth Avenue Elevated, showing the West 11th Street turnout and a new track being constructed from Little West 12th Street to Bethune. The old Greenwich Road ended at Southhampton (or Old Kiln) Road, now Gansevoort Street. The first load of Christmas trees being unloaded at West and Chambers Streets. Greenwich Avenue and West 12th (formerly Troy) Street. The next First Lady serves food to the needy. Unemployed women were served food by no less a personage than Mrs. Franklin D. Roosevelt at the Grand Central Restaurant in New York on December 1st. Her dress protected by an apron, the wife of the president-elect is seen as she ladled out soup for the hungry women. The fanciful clocktower of the Jefferson Market Court, the tallest of Greenwich Village's nineteenth-century buildings, is a local landmark. In 1877, Calvert Vaux and Frederick C. Withers designed the Ruskinian Gothic courthouse and jail with a clock tower, which served as a fire lookout. The Jefferson Market Court was renovated as a branch of the New York Public Library in 1967. 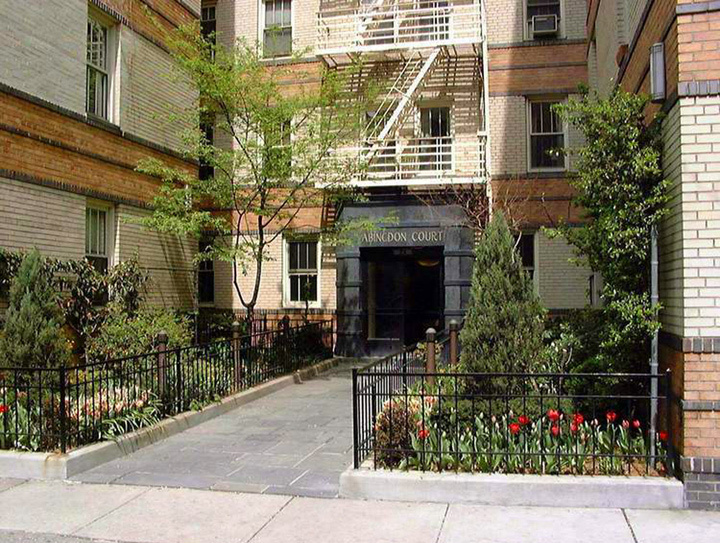 The Oasis of Washington Square, with Grace Godwin's Garret. Originally a tearoom on Christopher Street, the Pirates Den recreated the riggings, fittings, and buccaneer imagery of a pirate ship. Soon it evolved into a nightclub described as a "fantasy environment of lawless pleasure." The owner, Don Dickerson, a neighborhood character who was 6'6", greeted guests in full piratical garb, with a great coat, cocked hat, and bristling with flintlock pistols and a cutlass. Downing Street (formerly Herring Farm Road) at the corner of Varick. The Isba Tea Room on 4th Street. It is noted that the man depicted, Sashia, is "now a famous photographer in Europe." Lionel Kilberg, an army veteran (2nd from left), was licensed to perform weekly song programs in public. The smallest house in New York City, at 57 1/2 Bedford Street, was once the home of this famed poet. As a member of the Village's Bohemian fold, Millay acted, wrote poetry and captivated a string of competing suitors through the early 1920s. A junk cart interrupts the softball game. The last run of the NY Central Railroad up 10th Avenue. A cowboy on horseback preceded the train to alert pedestrians to get out of the way. A resident flapper hangs a poster for the Halloween Ball. Demonstrators stage a protest after Mayor Wagner deems the West Village a "blighted area." The City Planning Commission had been marking buildings for demolition with an "X" in their windows. Started in the 1920s by Meyer Horowitz, the Village Barn originally offered rural imagery, strange colors and barn dancing to commercial country orchestras. Shows were broadcast live on radio to the entire city. Campaigning near the Christopher Street subway station on Seventh Avenue South, outside of her campaign headquarters. "A spaghetti hat — very successful." 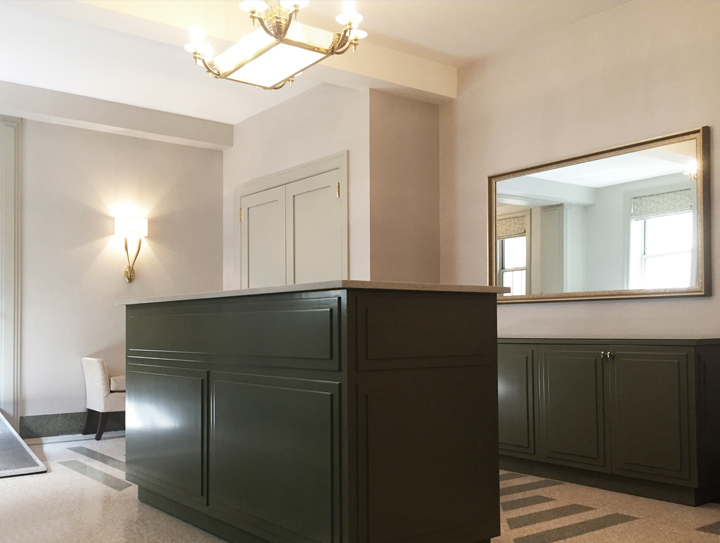 Anthony Zito had been in the neighborhood for many years, working out of a turn-of-the-century tenement on Bleecker Street. Although Zito's storefront was picturesque, the retail outlet represented a small portion of his profits. The heart of the business was in the basement, where bread was baked twice a day for delivery by truck to restaurants and groceries throughout the city. Zito's still operates at 259 Bleecker Street, run by Anthony's son Charles and grandson Charles, Jr. Behind the counter hangs a copy of Abbott's photograph. From Waverly Place. 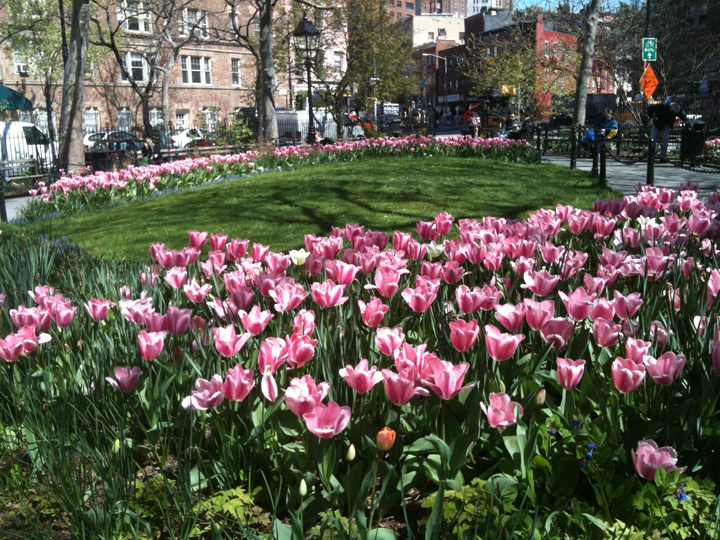 Beginning before the Revolutionary War, Greenwich Village was home to a sizeable African American population, centered in "Little Africa" around Bleecker and Thompson Streets and on nearby Gay Street. The street was named in 1834 after lawyer Sidney Howard Gay, an abolitionist and editor of the Anti-Slavery Standard. With the skull-and-crossbones design setting the cheerful mood of the racers, the 12th annual 'Anything on Wheels' derby is about to begin, sponsored by the Sloane Center, one of the seven New York children's centers maintained by the Children's Aid Society. Shortly after the crash, early Moving Day, about 6:30 a.m. Greenwich Avenue, looking north from 11th Street. By legislation, all leases in New York City began and ended on October 1st, causing chaos in the streets as everyone tried to move belongings on the same day. The New York City Traffic Department decided to locate the city's only foreign language street sign in Greenwich Village's Little Italy. Night View of Jack Delaney's Restaurant in Sheridan Square. New York City tenement district social worker. 58 Washington Square. Grace Godwin was a young single mother with four children who took over an infamous dive and print shop formerly called Bruno's Garret. Her spaghetti shop and tea room catered to locals and tourists with "tasty, inexpensive table d'hote and good-natured service." "Word soon spread that at Grace's Garret one could observe aspiring Village painters scratching graffiti onto the restaurant walls, or rub elbows with impoverished poets and budding Bolsheviks." (Jan Seigler Ramirez, Greenwich Village). Slum kids with giant bread loaf and pretzel. 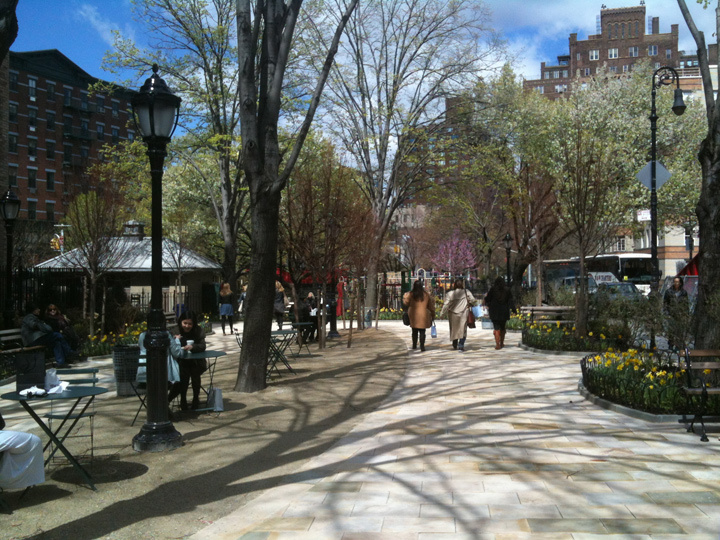 Sheridan Square. Founded in 1951 in a former Village nightclub by Jose Quintero and Theodor Man, The Circle in the Square is credited with beginning the Off-Broadway theater scene in 1952, with a successful staging of Tennessee William's Summer and Smoke, which had bombed uptown. Will O' The Wisp Tea Room, Sheridan Square. The Loew's Sheridan Theater, erected 1920-1921 at the corner of Greenwich and Seventh Avenues, is playing Jean Harlow's last picture. The old Riley Stables, which once occupied this corner, can be seen just before their demolition in 1920, in a photo displayed on the Fourth Floor East. At Mulberry Bend, Italian Quarter. Portrait of an immigrant family in their new living quarters. Children of various ages surround the mother, who is seated holding a baby on her lap. The Diamond Horseshoe�s stage manager, Arthur Barkow, has the kind of job that appeals to us. In this particular picture he is measuring a pretty leg for a pair of make-believe stockings. When Abbott photographed this shop window, August Pingpank was 87 years old, in business for over 50 years, and was said to be the oldest barber in New York City. On the verge of retirement, Pingpank remarked that "It's different now with the men shaving themselves every morning at home." Pingpank's shop, decorated with his customers' personalized shaving mugs, recalled the days before the invention of the safety razor. Reflected in the window is a horse-drawn cart, a fitting accompaniment to this representation of a bygone era. Marie Marchand launched a series of Greenwich Village eateries, in which she read palms and tea leaves, starting about 1912. Her portrait, by the painter John Sloan, hangs in the Whitney Museum of American Art.